Hassan Sharif, Cotton (still), 2013. Object and HD video, 20 x 67 x 46 cm and 8:25 minutes. Courtesy the artist and Gallery Isabelle van den Eynde. Hassan Sharif (b. 1951, United Arab Emirates) came of age during a formative period in the history of the United Arab Emirates. As he matured as an artist in the 1980s and 1990s he developed an oeuvre that moved beyond the limits of discipline or singular approach, encompassing performances, experiments, objects and semi-systems. Since the late 1970s, he has maintained a practice as a cultural producer and facilitator, moving between roles as artist, educator, critic, and mentor to contemporary artists in the United Arab Emirates. Approaching Entropy considers how two seemingly opposed trajectories, objects and semi-systems, can exist within a single philosophical approach to art. While objects are constructed via impulse, improvisation and widely available materials, semi-systems are governed by numerical equations that are open to chance and error and whose outcomes are not predetermined. Sharif constructs his objects from mass-produced materials made up of rubber, plastic and cloth that he twists and ties together into assemblages and piles. Once he becomes bored or too comfortable with a particular technique he will abandon the project and consider it complete. By contrast his semi-systems comprise works on paper that include line drawings and color studies and interpret, among other things, the artist’s relationship to time and space. The artist’s Cotton (pictured above) combines video with an object for the first time to explicitly share his process. 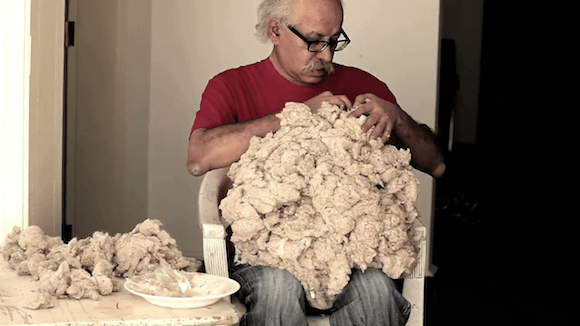 In the eight-minute video the artist grasps clumps of raw cotton, dips each handful into a bowl of glue, and then methodically builds a pile on his lap. His attentiveness to the task at hand masks the utter fecklessness of the project, which simply introduces a binding agent to turn one pile into another slightly modified pile. At the conclusion of this video Sharif slowly looks up and casts a satisfied glance at the viewer. Approaching Entropy invites viewers into an aspect of Sharif’s process, the leap from the beginning to the end state of an object or semi-system. Entropy holds order and disorder in tension with one another and acts as a measure of the latter and an indicator of the former. A system of random aleatory elements will reach an unsteady balance in much the same way that Sharif’s piles of matter begin to take form as art objects. This exhibition knits together the economies of labor embedded in Sharif’s materials, and reveals systems that are set up to fail, yet sustain a potential for completion and a capacity to perpetuate indefinitely. Sharif’s gestures, whether in semi-systems or objects, create works that capture the barely contained potentiality of their constitutive parts. Approaching Entropy reveals that each piece within these two trajectories toggles between containment and eruption depending on the calculus embedded in that work. More often than not a single work will hold both in hand, albeit uneasily, allowing us to continue our inquiry and participation in Hassan Sharif’s life work. What emerges in this show are striking new works that represent significant evolutions in Sharif’s obsessive processes. Hassan Sharif will be in conversation with Heinz Mack as part of the Guggenheim Abu Dhabi’s ongoing series of public panels and screenings, led by contemporary artists whose works are part of the museum’s permanent collection. This talk is moderated by Valerie Hillings and Reem Fadda.